This, the second tallest (next to Atlanta) air traffic control tower in the country, is one of our latest projects. Towering 370′ above Charlotte Douglas International Airport in Charlotte, North Carolina, and requiring nearly 900 tons of structural and miscellaneous steel, RAI served as fabricator and erector on this spectacular project. Twenty-six (26) stories of stairs and rails, and an additional ten (10) floors of structural steel. 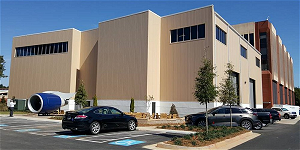 This complex Miscellaneous Steel project for Delta’s Flight Simulator Training Facility required detailed steel fabrication and installation at their world headquarters in Atlanta, Georgia. 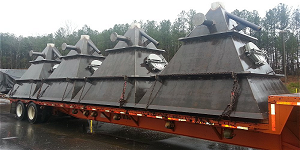 This project required sophisticated specialty fabrication of forty eight (48) precipitator hoppers for Georgia Power. RAI completed this complex fabrication project in budget and well ahead of schedule. Given a 20 week schedule for the completion, RAI effectively produced all 48 in less than 16 weeks.